12.5" RCOS @ ~f/9 (2880 mm fl) at 0.64 arcsec / pixel. Shown at 1.28 and 3.33 arcsec / pixel. 8/8/2013 to 11/8/2013 Chino Valley, AZ... with CCDAutoPilot5 & CCDSoft AOL guided. eXcalibrator v4.2 for (g:r) color balancing, using 45 stars from the SDSS-DR9 database. CCDBand-Aid to repair Kodak KAI-11000M vertical bars. CCDStack to calibrate, register, normalize, data reject, combine the sub exposures and selective Maximum Entropy deconvolution. PixInsight for color gradient removal, to create the RGB image and initial non-linear stretching. NGC 7497 is a spiral galaxy, type SBc, in the constellation Pegasus. 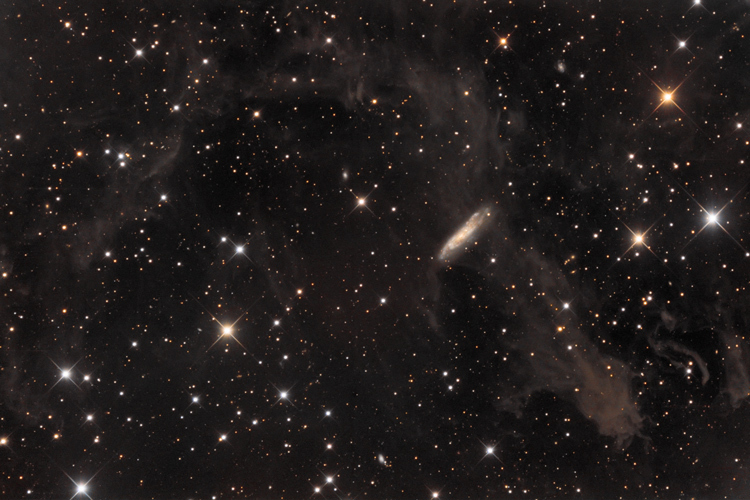 At a distance of about 59 million light-years, the galaxy is viewed through the Integrated Flux Nebula (IFN). The residual light of our galaxy illuminates this faint nebula.